Building on the experience from last year’s successful pre-FOSDEM meeting, the Free Software Foundation Europe and OpenForum Europe recently continued the tradition of bringing together active Free and Open Source Software (FOSS) groups a day before the FOSDEM event, in order to discuss public policy related actions at both the EU and the national levels. 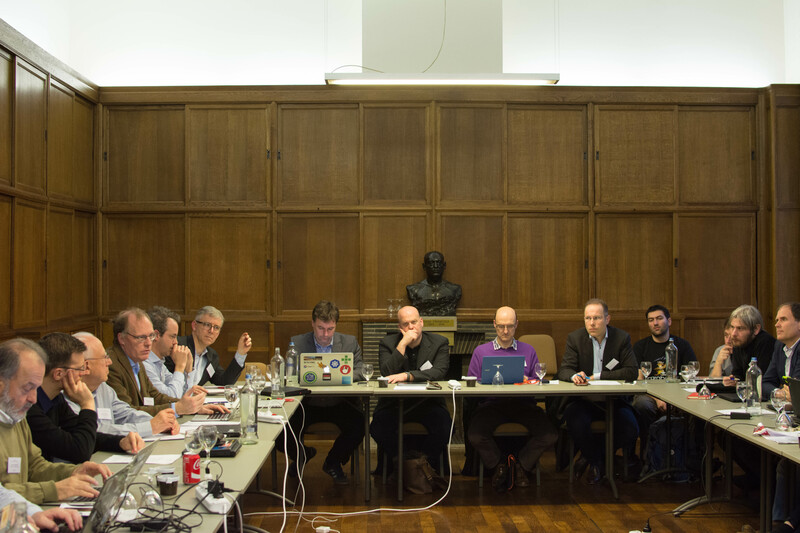 This year, the meeting focused on encouraging exchanges of views between individuals citizens and decision-makers, by providing practical first-hand information on topics relating to FOSS in public policy. The session started with Sebastian Raible (parliamentary assistant to Julia Reda (a Member of the European Parliament)), who gave a presentation about FOSS developments from the perspective of the European Parliament. He explained the progress of the Free and Open Source Software Audit (or FOSSA) programme, which was extended for another three years at the end of 2016, and explained that one of the main changes to the programme is that now it includes a new “bug bounty” incentive scheme, rewarding the discovery and reporting of new software bugs. Participants highlighted their concerns over the methodology of FOSSA, and the need to focus on its aim, namely, support for the security of the FOSS projects. His presentation can be found here. Next, Pierre Damas (Head of Sector, Digital Services at the Directorate General of Information Technologies of the European Commission) shared with the group some of the Commission’s plans for updating its Open Source Software Strategy, identifying the key barriers and motivations for adopting it in practice. According to Pierre Damas, although within the Commission FOSS is technically now treated equally with its proprietary counterparts, there remains a lack of political will to back up the mainstream adoption of FOSS technologies within the EU institutions. According to him, the next step for the updated Open Source Strategy in the Commission is the “digital transformation” of areas such as cloud, big data, and the Internet of Things. His presentation can be found here. Jaana Sahk-Labi (from the Estonian Permanent Representation to the EU) presented Estonia’s national framework for supporting the implementation of FOSS. Estonia is considered to be the leader in e-Government at the EU level, and is planning to highlight e-Government topics during its presidency of the Council of the EU, in the second half of 2017. One of the main challenges for the Estonian government in the upcoming presidency will be the right approach for future-proofing “no legacy” policies that continue after the term of Estonia’s presidency has come to an end. Consequently, Estonia is preaching for a digital revolution in the EU institutions. Her presentation can be found here. Laurent Joubert (from the French government) presented the Open Source Contribution Policy Template which has been drafted by numerous representatives from governments, non-governmental organisations, companies, international organisations and academic sector as a part of the Open Government Partnership. The aim of this template is to provide an easily shareable and ready-to-use template for governments – as well as other public administrations – to set up a policy for code contributions made by civil servants, which have to be open by default. The ultimate goal of such a policy is to facilitate, share and reuse the code developed by and for public administrations. His presentation can be found here. The speakers’ presentations were followed by a round table discussion, engaging the participants in considering the possibility creating a dashboard, which would serve as a tool for advocacy groups to assess best practices and policies for supporting FOSS and Open Standards (OS) in Member States. Part of the discussion was dedicated to finding ways to evaluate the existing national or regional policies which support FOSS. A couple of identified indicators of “openness” were: the level of FOSS usage; and the fact of using global analytics of online procedures. In addition, certain other criteria will also need to be taken into account: transparency of how FOSS is adopted in the public sector; the implementation of the policy in practice; and product maturity. The participants agreed to start working on listing the parameters which would describe “best behaviour” on the part of government, with a view to developing concrete steps or actions to support governments to achieve this. The meeting was a stepping-stone, paving the way for a bigger collaboration on how to promote public policies supporting FOSS across Europe. We hope to continue the collaboration and to coordinate our actions in order collectively to make a difference on the policy level. You can find the pictures of the event here. Collaborative development from multiple independent sources, generates an increasingly more diverse scope of design perspective than any one company is capable of developing and sustaining long term.